Bike, hike & paddle through Western Norway; discover an adventure landscape that will leave you spellbound. Imagine riding down narrow, winding backroads with lush green-leafy hillsides, slender valleys dotted with pasturelands where lazy livestock graze on the steps of sleepy farm villages and then launch a sea kayak onto a paddlers paradise, with rock gardens, white sandy beaches, playful seals, kelp forests, surging tides, soaring sea eagles, historical lighthouses, funky currents, long narrow winding fjords, before hiking rugged mountain trails past ancient huts to grand vistas. This is the essence of a spectacular multi-sport adventure that begins with celebrating the birth of John the Baptist before venturing into the wild fjords of the Sunnmøre Alps. Norway’s ‘Art Nouveau’ City is the perfect starting point for a multi-sport adventure along the wild fjords of the Sunnmøre Alps; the longest day of the year under an Arctic sky, on the shores of the North Atlantic is the ideal backdrop and marks the perfect start for exploring Western Norway. People powered we peddle, paddle and hike seeking out the highlights of Norway’s New Style city, it’s wild fjords and majestic mountains. See first-hand colorful blossoming parks, lush leafy green hillsides, a skyline of art nouveau interspersed with modern architecture, a blazing inferno and a spectacle of merry-making locals celebrating the longest spring nights upon a backdrop of pleasure-crafts bobbing on glistening fjords. Before, jumping on bikes and heading into the fjords, riding down slender valleys dotted with verdant pastures, quaint farms and grazing livestock lined by towering jagged peaks of the Sunnmøre Alps. The days fly by as we paddle, peddle and wander through these wild fjords which have cut their path deep into the Sunnmøre Alps, creating a surreal landscape that is both awe-inspiring and breathtaking. The Arctic Summer Solstice & Wild Fjords Multi-Sport Adventure is an 8-day magical journey where we ride bicycles, paddle sea kayaks and hike from the Pearl of Art Nouveau perched on the shores of North Atlantic down Wild Arctic Fjords, staying at cozy inns, and dinning on local specialities. On route we will gain first-hand insight in the history and culture of a rugged mountain people and the fjords that connect them. A long dark Arctic winter gives way to bright sun-filled days & nights with daylight stretching around the clock, all culminating with the longest day of the year, the summer solstice. In Norway, a celebration of light vs darkness takes place on ‘Sankthans’ a festival honoring the birth of John the Baptist, where the lighting of bonfires to ward of evil witches is a festival not to be missed. And, the best place to experience this crazy spring tradition is Ålesund. 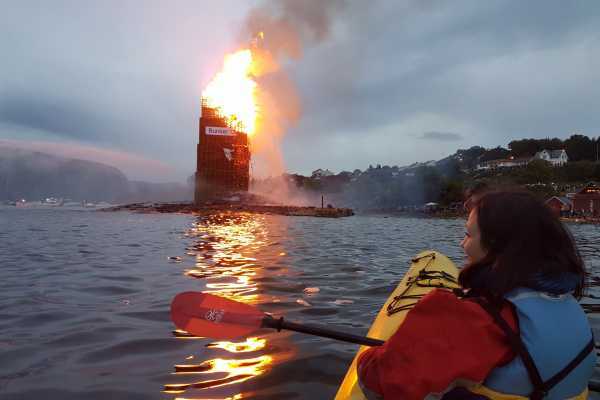 Join in the happening at the Jonsok Slinningsbålet festival, with the lighting of the world’s tallest wooden pallet bonfire. Get swept up in the party-frenzy atmosphere of loud music, chanting, singing, the myriad of boats and the intense heat from this raging inferno, along with all the crazy antics of Norwegian being Norwegians. Wild Norwegian Fjords have cut their path through the granite and gneiss mountains of the Sunnmøre Alps, creating a surreal landscape that is both awe-inspiring and breathtaking. Formed like canyons with steep walls that begin 400 meters below the sea’s surface and then stretching over 1500 meters above. This is an area of raw natural beauty with snow capped mountains, towering granite walls, thundering waterfalls, mountain ledge farms, flowering fruit trees, and quaint villages tucked into small protective bays. The fjords of Sunnmøre invite to adventure, their charming villages have hosted adventure travelers for generations. Deep in the fjords, where the mountains finally block the sea from penetrating further westward; thundering waterfalls rush down granite walls that climb up 1500m marking the entrance to the famous Jotunheimen Mountain Range. We are excited to bike, hike & paddle through Western Norway with you! Norway’s ‘Art Nouveau’ City is the perfect starting point for a multi-sport adventure along the wild fjords of the Sunnmøre Alps; the longest day of the year under an Arctic sky on the shores of the North Atlantic is the ideal backdrop and marks for the perfect start for exploring Western Norway. Unfortunately we are unable to publish our trip itinerary, due to the fact that we operate in Norway and over here Norwegains and Norwegian companies will only copy our orginal trips and try to pass them off as their own work. Therfore, we can't publish an exat itinerary but we are more then happy to e-mail you a detailed trip itinerary, please send an E-Mail to office@kmtnorway.com to receive a detailed itinerary.